Why We’re Awesome- A series spotlighting wonderful organizations that empower women and girls all over the world. Science. Blerg. Many young girls will tell you it is their least favorite subject. But not these girls! Girls Who Code is a New York City based organization with the goal to close the gender gap in science based careers by training young girls interested in learning computer specialist techniques. Hence the name: Girls Who Code. 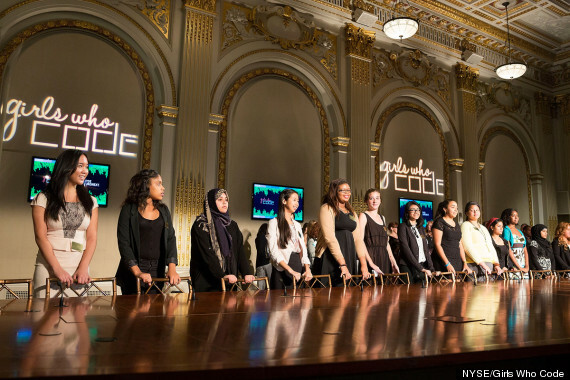 Girls Who Code aims to provide computer science education and exposure to 1 million young women by 2020. This is an organization that the U.S. education system has been needing for a long, long while. After all, to say girls don’t like science and math is simply a myth created from the way our education system is structured. Don’t agree? Check out the facts below. Women today represent 12% of all computer science graduates. In 1984, they represented 37%. Thank you, Girls Who Code, for helping young girls find their love for science, again. Programs like this are making the U.S. just a little more like the progressive place we all hope to see one day, and that’s why Girls Who Code is awesome. Girls Who Code began in NYC, but is currently working to launch programs in San Francisco, Detroit and San Jose in the year 2013.